Well, now that Puck Pontiff Mark Chipman and once-inert general manager Kevin Cheveldayoff have addressed two of the Winnipeg Jets’ specific wants and needs, guess where the focus shifts? That’s right, Mr. .500 standing behind the bench. It’s squarely on you. You know that annoying laundry list of excuses that you made a habit of trotting out during the Jets’ latest crusade that ended, once again, without a playoff whisker sprouting from your players’ chinny, chin-chins? Sorry, but whinging about the schedule, injuries, youth and the price of petrol won’t cut it anymore. Probably not even with mainstream news snoops, a number of whom actually bought your bunk. Time to deliver the goods, Coach Potty Mouth. You’ve got your goaltender and, even though I don’t expect Steve Mason to be the second coming of Terry Sawchuk, I’m guessing (hoping?) that he and the work in progress known as Connor Hellebuyck won’t be the second coming of Pokey and the Bandit either. I don’t know if you’re familiar with Pokey and the Bandit, Coach Potty-Mo. Two interesting, young dudes from the back half of the 1980s. One, Daniel Berthiaume, was mostly a cheery sort and the other, Eldon (Pokey) Reddick, had a tendency toward the sullen, with gusts up to sourpuss. Together, they combined to provide Winnipeg Jets 1.0 with the sort of goaltending that will cost a National Hockey League coach his job. Matter of fact, two head coaches and one GM drew pink slips during their tour of duty in the blue ice. So, no Coach Potty-Mo, you don’t want your tandem of Mason-Hellebuyck to be Pokey and the Bandit II. But, again, even if they bottom out, it’s going to be on you and your system(s). Meanwhile, the Puck Pontiff and Chevy added one-vowel-short-of-a-full-load Dmitry Kulikov to shore up the left side of your blueline brigade. They’re telling you he’s an upgrade on Mark Stuart. You might not agree, given your fascination with greybeards of sketchy skill, but a left flank of Josh Morrissey, Toby Enstrom and Kulikov sounds better to me than Morrissey-Enstrom-Stuart. On the down side, Coach Potty-Mo, they took away your favorite play thing, Chris Thorburn. I’m not convinced that means you’ll be less of a street busker with your forward combinations—your juggling Thorbs from fourth to first line and the two slots in between truly was annoying—because you’re apt to adopt a new teacher’s pet to infuriate the faithful. You have your way of doings things, curious as they are, Mr. .500. They’ve seldom worked, but now they must work. If there are no meaningful matches being contested at the Little Hockey House on the Prairie next April, you’re the fall guy. Still no contract extension for Maurice, whose lifeline has been reduced to one more season as the ice-level puppet master. Not that I think he deserves a new deal, but Cheveldayoff repeatedly insists that he and his head coach are joined at the hip. So what’s the hangup? Could it be that the Puck Pontiff has grown iffy about Coach Potty-Mo? Naw. He won’t let Maurice go into the season as a lame duck. I say it gets done this month. 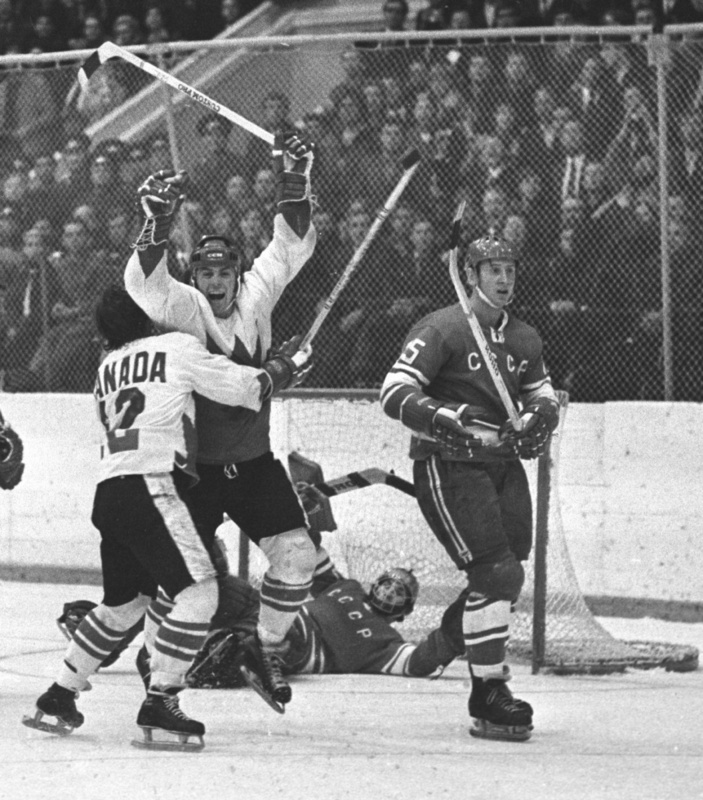 Paul Henderson and Yvan Cournoyer celebrate the iconic goal. I get a chuckle out of young people who weren’t even an embryo in 1972 telling those of us who were there that their goal in 2010 was more iconic than our goal. Our goal, of course, is Paul Henderson sliding a shot under Russian goaltender Vladislav Tretiak, in a hostile, corrupt environment a world away to win a signature, culture-shifting hockey series that was as much about politics as pucks. Their goal is Sidney Crosby whipping a shot through Ryan Miller’s legs to win an Olympic gold medal against a southern neighbor in front of friends and family in the cozy confines of our own back yard. Only someone who lived both can compare both, and there is no comparison. Yet Emily Sadler of Sportsnet submits that Crosby’s 2010 golden goal is the most iconic moment in Canadian sports history. I submit that Emily is showing her age. I get the drill. 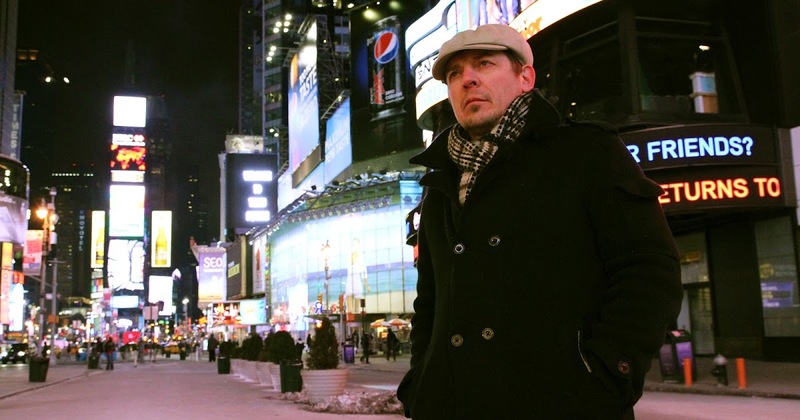 The Sadler piece was meant to stir conversation and debate, which it no doubt did. But, geez, someone at Sportnet might have clued in and had a writer who was at least knee high to Yvan Cournoyer in ’72 scribble that story. A 30something simply cannot relate to the Cold War intrigue of the times, any more than they can provide a first-hand account of what it was like when John, Paul, George and Ringo arrived on our shores. Heck, most of them don’t even know who John, Paul, George and Ringo are. Moving to present-day topics, I note that a group of 40 guys in Buffalo have set a new world record for marathon shinny by playing an 11-day hockey game. Yes, 11 days. By happy coincidence, Buffalo Sabres forward Evander Kane has now gone 11 days without being in trouble with the law. Just wondering: Would you want a field goal kicker who’s last name begins with the letters C-R-A-P? That’s what the Saskatchewan Roughriders have in Tyler Crapigna, whose wonky right leg has failed Gang Green twice when they needed it most. The Riders are already 0-2 on a new Canadian Football League season, leaving us to wonder what the before/after is on head coach Chris Jones being asked to leave that swanky, new building on the bald Saskatchewan prairie? I say he’s gone by Labour Day, especially if he doesn’t find a leg that aims straight. Here’s proof that sports scribes carry no influence on the public: Steve Simmons of Postmedia pleaded with his readers to support the Toronto Argonauts prior to their home-opener vs. Hamilton Tiger-Cats, writing: “Please, pretty please, pretty, pretty please, buy a ticket and take in the game against Hamilton.” Let’s ignore the deeper issue, that being a prominent Canadian columnist serving as a screaming shill for the Argos and the CFL. I’m actually okay with that because, like Simmons and most others who have covered three-down football, I love the CFL. As for Simmons’ sway with readers, the head count was only 13,583 for the opener and even less, 11,219, for their encore performance against the B.C. Lions. He has more than five times that many followers on Twitter. Well, look who’s dropped in for an unexpected chit-chat about all things Winnipeg Jets. That’s right, it’s the Two Hens in the Hockey House, who, when last seen, were breaking away to enjoy summer. 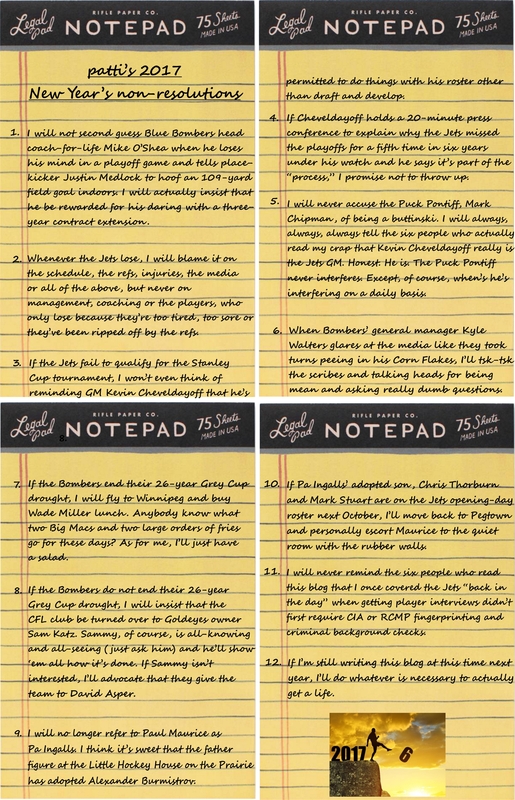 Turns out they delayed their good, ol’ summertime frolic to discuss the most recent goings-on with their fave National Hockey League outfit and its general manager, Kevin Cheveldayoff. Question Lady: What gives, girlfriend? I thought we were going to give our jaws a rest until October. What happened to a summer sans chit-chat about the Jets? Answer Lady: Kevin Cheveldayoff happened, that’s what. Answer Lady: Well, once they put the NHL entry draft to bed, I was convinced he’d become Rip Van Chevy and snooze the summer away, like he always does. Remember? Way back in April, I predicted this would be Chevy’s seventh annual Summer of Nothing. So what does the guy do? Instead of heading to the cottage to dip his fishing line into the lake, he dips his toes into the free-agent pool. He goes all GM on us. Go figure. Question Lady: So, what are you telling me, that you were wrong? Answer Lady: Yes, I was wro…I was wro…geez, I’m like the Fonz on Happy Days. I can’t say the word wro…oh, pooh. I was mistaken about Chevy. This time. Every other time I was unmistaken. Question Lady: Actually, you weren’t wrong, girlfriend. You predicted that Chevy would be active once the free-agent bell rang. You said he’d sign at least one player. Remember which player? Answer Lady: Oh, ya, Chris Thorburn. D’oh! Can you believe the St. Louis Blues actually reeled that sluggo in for two years, at 900K per? Were they not paying attention? Thorbs is a five-minutes-a-night forward with zero upside. Question Lady: Aren’t they buying his bare knuckles? You know, to replace Ryan Reaves? One goon for another? Answer Lady: Oh, ya, like that’s going to fly with the faithful in St. Loo. Thorbs is a fighter like I’m Jennifer Aniston’s stand-in. He drops his gloves and holds on like barnacles clinging to the hull of a rusty, old ship. He had what, 13 scraps last season? And threw maybe four punches. By the way, they don’t call players like Reaves and Thorbs goons anymore. They’re energy enforcers, don’t you know. Question Lady: I’ll try to keep that in mind. Meanwhile, won’t Thorbs be missed? Answer Lady: Ya, like a yeast infection. Thorbs and Anthony Peluso have long been my measuring sticks for the Jets’ progress. I said in June 2015 that the presence of either in the lineup served as a retardant to the development of the young players, and only when Thorbs and Joe Palooka were told to vamoose would we see actual progress. They’re both gone—hallelujah!—so I guess it’s game on. Question Lady: Is Steve Mason going to be the answer in goal next season? Answer Lady: I’d feel a whole lot better about Mason if he wasn’t coming over from Philadelphia. I mean, the Flyers know goaltending like Gary Bettman knows the North End of Winnipeg. They haven’t had anyone who could stop a sniffle since Ron Hextall was acting like a one-man SWAT team in the 1980s. Talk about a guy off his nut. And now Ronnie Axe-tall is the Flyers GM. Who’d have thunk that? Question Lady: Shouldn’t we be concerned that if Hextall has no use for Mason, Cheveldayoff could have done better than a recycled Philly Flyer? Answer Lady: I’m going to cut Chevy some slack here. Yes, he’s goalie blind. As goalie blind as the Flyers. And it’s of his own doing that he found himself sifting through the dregs of the goaltenders who became available in the past 2½ months. But…at least he did something. Finally. Even a Philly Flyers reject has to be better than what Connor Hellebuyck and Michael Hutchinson delivered last season. Question Lady: You don’t think Hellebuyck is the real deal? Answer Lady: Is Homer Simpson the poster boy for good parenting? Does the Pope skip mass? If Hellebuyck played in New Jersey or Columbus or San Jose, no one in Jets Nation would be talking about him. I mean, it’s not like everyone in the NHL is saying, “Geez, if we could pry that Hellebuyck guy out of Winnipeg we’d be a shoo-in to win the Stanley Cup.” I think Hellebuyck will be an upgrade on Hutchinson as a backup. That’s as half full as I can make that glass. Question Lady: What do you know about the defenceman Chevy reeled in, Dmitry Kulikov? Answer Lady: I know he’s a Russian, he shoots left, he spent an awful lot of time in the repair shop last season, he’s buddies with Blake Wheeler and Rink Rat Scheifele, he’s overpaid, and he could use one more vowel in his first name. Question Lady: That’s it? That’s all you have to say about him? Answer Lady: What else is there to say? The guy was a bust in Buffalo, but the Jets believe he’ll be boffo paired with Buff. Now stop me before I OD on alliteration. Question Lady: So are you giving Chevy a passing grade for his off-season tinkering? Answer Lady: Mostly, it’s been addition by subtraction. Gone are Thorbs, Peluso, Ondrej Pavelec, Mark Stuart, Paul Postma…that’s all good. Meanwhile, the Jets are better with a Mason-Hellebuyck combo than Hellebuyck-Hutchinson and, if buy-a-vowel Dmitry works out, the blueline is improved. But Chevy gagged at the expansion/entry drafts by dropping 11 slots in the first round just to protect fringe players on a non-playoff roster. And, he still hasn’t dealt with the elephant in the room—Jacob Trouba’s desire to get out of Dodge. Getting Trouba’s signature on a long-term contract ought to be priority No. 1. Overall, I’d give Chevy a passing grade C, for getting the goalie and for what he unloaded. He’s probably earned a week or two of down time at the cottage. Question Lady: Before we go, what did you think of the TSN and Sportsnet coverage on free-agent day? Answer Lady: I mostly watched TSN and their talking heads did boffo business, although I cringe every time I see Aaron Ward. Still can’t get past that domestic violence issue. As for Sportsnet, was it bad-hair day on the panel, or what? I mean, what’s up with the mops on Elliotte Friedman and Nick Kypreos? Friedman looked like he had half a head and Kypreos looked like he had his hair cut at Coif du John Deere. I swear, he must have laid down on the lawn and let someone run over his head with a riding mower. And the glare from John Shannon’s coke-bottle glasses blinded me. I’m still seeing double. Other than that, it was all good. Both groups were on their games. Question Lady: Okay, that’s it. Time to do summer. See you in October. Answer Lady: Sounds like a plan. Have fun and don’t forget your sunscreen. I have a question for those of you in Jets Nation now heavily engaged in the annual spring ritual of teeth gnashing and gazing at navels: What did you expect? Yes, of course, I understand that you’re a frustrated, fed up and flat out PO’d lot because there shall be no meaningful matches played at the Little Hockey House on the Prairie beginning next month. But seriously. Surely you knew in advance that the Winnipeg Jets’ 2016-17 crusade would be an angst-inducing exercise guaranteed to expose the local lads as lacking in the necessities and, thus, leaving them—yet again—with their noses pressed against the window as they view the Stanley Cup derby from the outside-in. If you thought otherwise, you weren’t paying attention last autumn. Naturally, the Puck Pontiff (that would be meddlesome co-bankroll Mark Chipman) and his ring-kissing College of Yes Men fronted by general manager Kevin Cheveldayoff and the potty-mouthed head coach, Paul Maurice, didn’t say it in so many words. They didn’t have to. It was painfully obvious that they were in organizational tank mode from the get-go. It wasn’t the heavy infusion of peach-fuzzed faces that led me to that conclusion. I had no quarrel with it. After all, when your club’s ad nauseam mantra is draft-and-develop, youth must be served at some point, so you gird your loins knowing the forecast calls for pain. Trouble is, they didn’t go far enough. Chris Thorburn should not have been on this team. Ditto Mark Stuart. That was in June 2015. Thorburn is still to be found in Jets linen. So think of it this way: Cheveldayoff and his scouts have participated in six NHL entry drafts and they have heard the hosannas rain down for their handiwork in the first round (hello Mark Scheifele, Jacob Trouba, Nikolaj Ehlers, Morrissey and Laine). Yet they have unearthed nary a grinder who is better at hockey than Chris Thorburn? The mind boggles. That is not to slight Thorburn. He need not make apologies for being Chris Thorburn. But his ongoing presence in the Jets lineup is a harsh indictment on the Puck Pontiff, Cheveldayoff, his bird dogs and, perhaps most of all, Maurice. Paul Maurice is a snake oil salesman. He is, as they say in cowboy country, all hat and no cattle. Few talk a better game than coach Potty-Mo, who, for all his TV-smooth blah, blah, blah, delivers a phony bill of sale. At some point very early next season, he will become the losingest coach in NHL history and it isn’t difficult to see why. The Jets’ defensive deficiencies, the complete disregard for discipline, the dumpster fire that is the penalty killing, the logic-defying player deployment, the Thorburn fetish…that’s all down to coaching. Paul Maurice: No. 3 on the NHL’s all-time loser list. Here’s something else to consider: I’m convinced that coach Potty-Mo, much like his predecessor Claude Noel, is afraid of Dustin Byfuglien because he refuses to rein in his rogue rearguard. And that, Jets Nation, would explain Chris Thorburn’s lifetime contract, five of six seasons with their noses pressed against the window when the post-season commences, and zero playoff victories. Let the teeth gnashing and navel gazing continue. I don’t make New Year’s resolutions. What’s the point? I know I wouldn’t keep them. I mean, I could resolve to cease my regular criticisms of jock journalists. And I could really, really mean it. Girl Guides honor. Cross my heart and hope to die. But then one of the girls or boys on the beat would scribble or say something goofy, dumb, ridiculous or all of the above and it would be like a tub of chocolate swirl ice cream—I would have to have at it. Thus, I do the opposite. I make New Year’s non-resolutions. That way, I can’t go wrong. I know I’ll break every one of my non-resolutions long before the year is done and I’ll be happy about it. Patti Dawn Swansson has been writing about Winnipeg sports for 47 years, longer than any living being. Do not, however, assume that to mean she harbors a wealth of sports knowledge or that she’s a jock journalist of award-winning loft. It simply means she is old and comfortable at a keyboard (although arthritic fingers sometimes make typing a bit of a chore) and she apparently doesn’t know when to quit. Or she can’t quit. She is most proud of her Q Award, presented in 2012 for her scribblings about the LGBT community in Victoria, B.C., and her induction into the Manitoba Sportswriters & Sportscasters Association Media Roll of Honour in 2015. What’s that chirping I hear? Crickets? Nope. It’s the natterbugs. 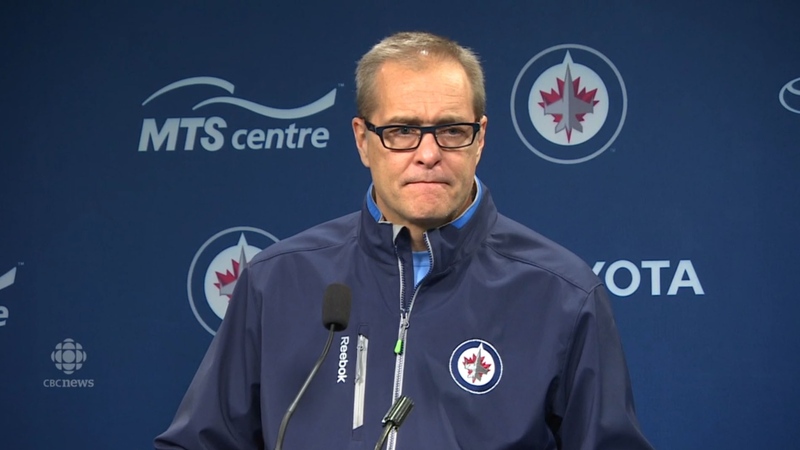 They’ve begun to make noise about Paul Maurice, who, should the Winnipeg Jets’ current funk stretch beyond five games, soon will be described as a much-maligned man. No surprise there, really. I mean, the Jets went 0-for-the road last week, so it must be the head coach’s fault. Surely, his best-before date is about to expire. Well, you can put the pitch forks and torches away. Pa Ingalls isn’t going anywhere. 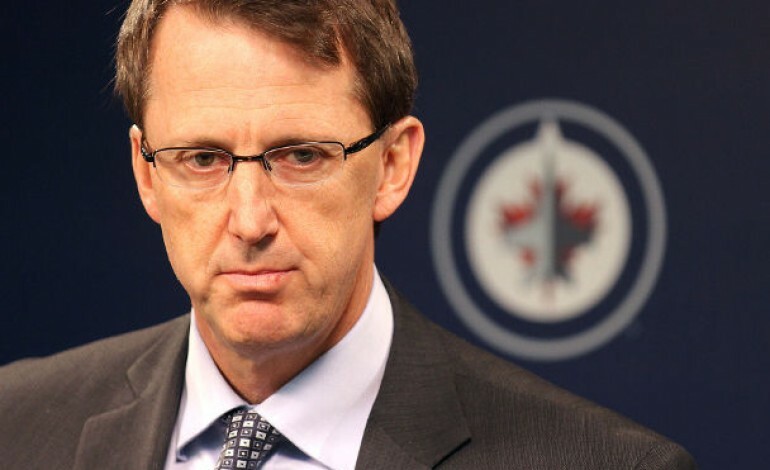 When Puck Pontiff Mark Chipman and his College of Yes Men headed by general manager Kevin Cheveldayoff chose to go all-in on the greening of the Jets at the commencement of this National Hockey League crusade, they were telling us that their expectations vis-a-vis the playoffs were low and, short of mutiny, nothing was going to move Maurice from behind the bench. Ownership/management were giving him a Mulligan before he took his driver out of the bag. Think about it. They saddled the guy with a gaggle of greenhorns. By my count, there were half a dozen rookies at the start of business. More youth joined the fray due to various owies. What did you expect would happen? This is the nature of the youth beast: All-world one night, all-woe the next five. The same scenario is unfolding in the Republic of Tranna, where the Maple Leafs tease then torment the rabble, and in Buffalo, where the Sabres show promise then perform a faceplant, all the while wondering if the other shoe will drop on Evander Kane. And, of course, we watched it in Edmonton, where the Oilers were a decade-long, class-action joke and remain erratic, even with Connor McDavid on board. So get used to it, Jets Nation. This season will have more ups and downs than the Trans-Canada Highway through the Rocky Mountains. I don’t want to sound like an apologist for Maurice. I’m not. It’s just that I believe he’s been set up to fail this season. The Puck Pontiff and his College of Yes Men went younger by design, and I don’t think they expect the Jets to qualify for the Stanley Cup tournament. Is the goaltending Maurice’s fault? I doubt Cheveldayoff would recognize elite puckstopping if Patrick Roy and Martin Brodeur were playing pond hockey in his back yard. How, then, can ownership/management or anyone else lay the blame at the coach’s feet? They can’t. Thus, he stays. None of this is to say Maurice is fault free. He juggles his forward lines like he’s a street busker. His unwavering faith in, and reliance on, Chris Thorburn remains as much a mystery as how they get the caramel inside a Caramilk chocolate bar. Mark Stuart belongs on an NHL roster like Don Cherry belongs on the cover of a Moscow tourism brochure. Then there’s coach Pa Ingalls’ adopted son, Alexander Burmistrov. Can we not send him back to the Russian orphanage? I don’t know about you, but I often detect a whiff of haughtiness in many of Maurice’s chin-wags with news snoops. There’s just something about his way with words that suggests a self-declared upper-crustacy. But can he really be the smartest man in the room when he spouts the kind of nonsense he delivered on the heels of a recent loss to the Carolina Hurricanes? “Bryan (Little) played four shifts for us this year, so our No. 1 centreman is out,” he said. “Matty Perreault’s been gone for a while, that’s our No. 2 guy.” Either Maurice thinks we’re stupid, or he’s actually the dumbest man in the room. If he truly believes that Mark Scheifele, the NHL’s leading point collector at the time, is his third-line centre and will be slotted as such once Little and the do-nothing Perreault return from the repair shop, he should be fired immediately. If Dustin Byfuglien is this bad in the first go-round of his five-year contract, how bad will he be in the 2020-21 season, at which time he’ll be 36 years old and likely weigh about 300 lb.? It’s clear that Byfuglien is getting far too much ice time from Maurice, who, much like his predecessor Claude Noel, treats Big Buff with kid gloves. Sit him down, for cripes sake. He’s not Bobby Orr. Give the top-pairing minutes to Jacob Trouba. I’ve heard enough whinging from Maurice and the rabble about the Jets horrible, unfair, cruel, hardship, blah, blah, blah schedule. Yes, it’s a grind, but no more so than what the Calgary Flames or Edmonton McDavids are dealing with this month. The Flames will play 16 games in November, 11 on the road and four back-to-backs. The McDavids play 15 games, 10 away from home. The Jets will be 16 and 10. The Dallas Stars play 16 games. So, don’t talk to me about the schedule. It’s a copout. Does Sportsnet know that the 104th Grey Cup game will be played this afternoon in the Republic of Tranna? There were exactly zero stories about the Canadian Football League title match on the front page of the Sportsnet website when I brought it up at 5 o’clock this morning. Zero. There were more than a dozen on the TSN front page. I know it’s the easy pick, but I’ve got to go with the Calgary Stampeders in the large football match this afternoon. I’m thinking it’ll be a whupping, and only garbage points by the Ottawa RedBlacks in late-game skirmishing will make it seem closer than the reality of a rout. Calgary 32, Ottawa 19. Can’t let the puck drop yet, folks. Not until the Question Lady and the Answer Lady have had their say. They’re my go-to girls. Consulting with them always is my final order of business before the Winnipeg Jets strike out on a fresh National Hockey League crusade, because, unlike some of our mainstream media friends, they don’t feel obligated to play nice for fear of offending the Puck Pontiff and his College of Yes Men in the inner sanctum at True North Sports & Entertainment. The Hens in the Hockey House are unplugged and unfiltered. Always. If they see a spade, they don’t just call it a shovel. They tell us what kind of muck is on the shovel and how it got there. I would say they’re two female Donald Trumps, except they don’t have orange skin or horrible hair and they don’t brag about grabbing the groins of unsuspecting females. Question Lady: Where to begin? With Jacob Trouba? With Ondrej Pavelec? With all those rookies? I guess Jacob Trouba is as good a place to start as any. Are the Jets going to miss his presence on the blueline? Answer Lady: Like I miss ABBA. I loved ABBA. I don’t love the Jets D. I mean, look at the third defence pairing they’ll have Thursday night when the Carolina Hurricanes come calling at the Little Hockey House on the Prairie—Mark freaking Stuart and your choice of Paul Postma or Ben Chiarot. And they’ve got a greenhorn, Josh Morrissey, in the top pairing with Dustin Byfuglien. Will big Buff be babysitting or freelancing? Defence will be the Jets’ Waterloo, which, by the way, is a boffo ABBA tune. Question Lady: A lot of people think the Jets should send Trouba a message by letting him rot, rather than cave to his trade demand. What do you think? Answer Lady: If by “rot” people mean let him sit out the entire season or go play in Europe, how does that benefit the Jets? 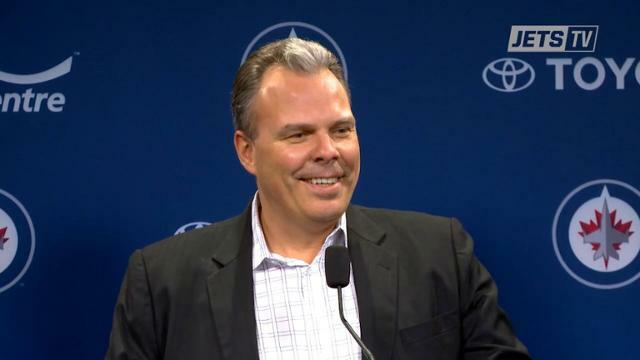 Everyone seems to think general manager Kevin Cheveldayoff has the winning hand in this game of Winnipeg Hold ‘Em, but I don’t necessarily agree. If Trouba digs in his heels—really digs in—and Chevy refuses to lower his sticker price in trade discussions, he runs the risk of having wasted a first-round draft choice on Trouba. I don’t think he’s prepared to let that happen. Chevy wants Trouba playing, not rotting. Something has to get done. Question Lady: A lot of the media say Trouba has been given bad advice by his agent, Kurt Overhardt. What do you think? Answer Lady: The media would know this how? I doubt Trouba and Overhardt invite news snoops to join their intimate chin-wags. Unless they wiretap his phone, they have no way of knowing what’s been said and to whom. Yet they paint Overhardt as the bad guy or Trouba as a spoiled brat. This isn’t about bad guys and good guys. It’s about people doing business. Question Lady: Okay, enough of Trouba. The Jets will be icing a lineup that includes rookies Patrik Laine, Brandon Tanev, Kyle Connor, Morrissey and goalie Connor Hellebuyck. And Nikolaj Ehlers is a sophomore at 20. Does this broad-stroke youth movement mean the Jets are in tank mode right from the get-go this season in the hopes of landing Nolan Patrick at next year’s draft? Answer Lady: Let me answer that question with a question…would you rather lose with Kyle Connor and Connor Hellebuyck or Anthony Peluso and Ondrej Pavelec? This is the natural order of things. I think it can be said that the Puck Pontiff and his College of Yes Men have conceded that this season won’t end well, but the players won’t tank. Ever. Not even for Nolan Patrick. Question Lady: One writer, Paul Wiecek of the Winnipeg Free Press, suggests that this is the first year of Chevy’s second five-year plan. Does than mean another five years of losing? Answer Lady: There never was a first five-year plan, so this cannot be the second five-year plan. Chevy will never put himself on the clock. Only the Puck Pontiff can do that. As I’ve said before, the plan is a plan of no beginning and no end. It’s all very zen. We will see the results when we see the results, grasshopper. Question Lady: But won’t owner Mark Chipman eventually run out of patience with Chevy if the team keeps missing the playoffs? 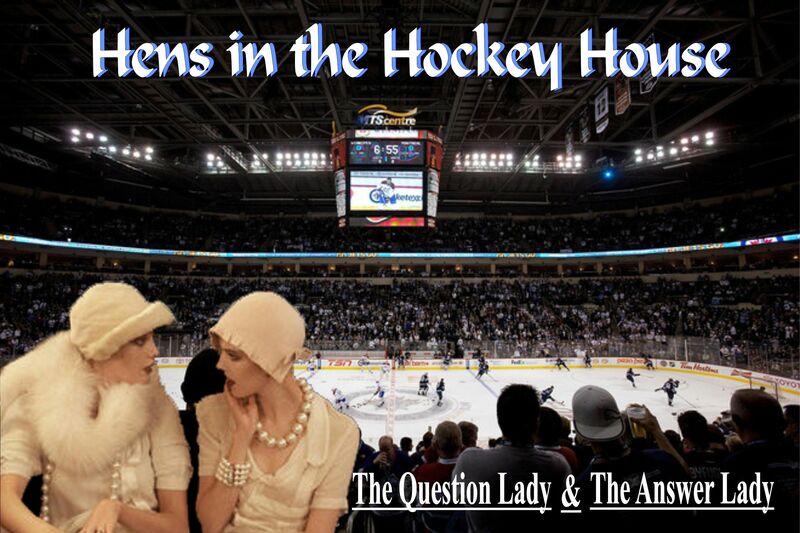 Answer Lady: The Puck Pontiff’s patience will expire if the Jets are losing and no one is there to see it happen. 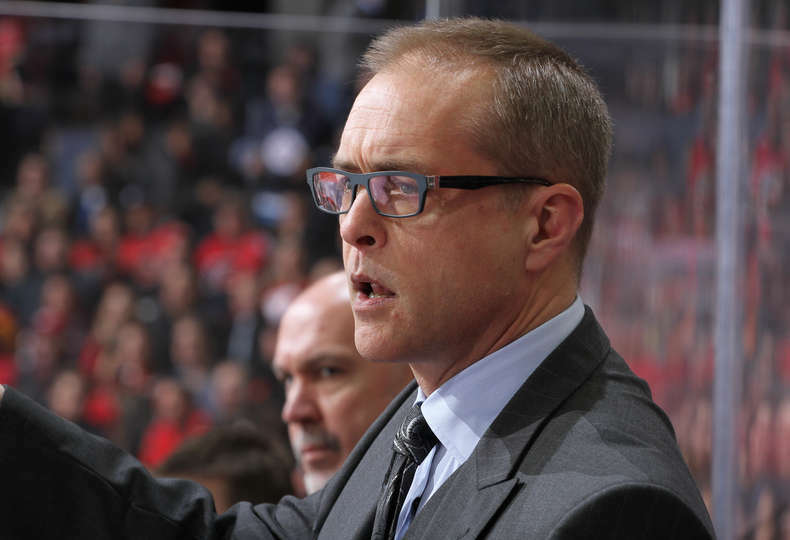 Question Lady: Is coach Paul Maurice’s job safe, too? Answer Lady: What do you think? They’ve saddled the guy with a bunch of kids who were asking Drew Doughty for his autograph six months ago. Now they’re expected to beat him one-on-one. Do the math. Question Lady: I don’t know about that. Seems to me the Jets have a nice blend of youth and experience, no? Answer Lady: You mean like Chris friggin’ Thorburn and Mark freaking Stuart? Good luck with that. Question Lady: No, I mean like Dustin Byfuglien, Toby Enstrom, Bryan Little, Matty Perreault and Blake Wheeler. I think Wheeler is a great leader and will make a great captain, don’t you? Answer Lady: I suppose Wheeler was the right choice as captain. For now. He won’t be here in another three years, though, so they should have given the C to Mark Scheiffele. He’s a Jets lifer. 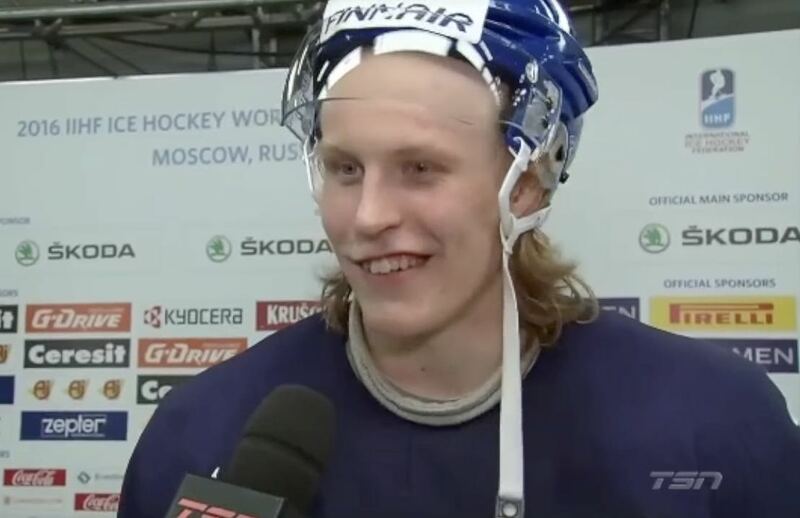 Question Lady: What do you expect out of Patrik Laine in his rookie season? Question Lady: No, I’m talking about production. Answer Lady: So am I. Question Lady: Be serious. Can Laine duplicate what that other fab Finn did for the Jets? Answer Lady: If you mean Teemu Selanne, of course not. If you mean Hannu Jarvenpaa, let’s bloody well hope not. I mean, Hannu was a great guy, but he scored the grand sum of 11 goals for the Jets. I suspect Laine will have that many by the time Jacob Trouba comes crawling back, is traded or he starts playing in Europe. Question Lady: What’s an acceptable number for Laine? Answer Lady: First of all, let’s stop all foolishness. Laine is not the second coming of the Finnish Flash. Don’t call him Finnish Flash 2.0 or Finnish Flash the Sequel. If he develops into the Flashy Finn, fine. But I’d say a good over/under for him as a rookie is 20 goals. If he scores 20 or more, I’m sure the Jets will be delighted. Anything less, not so much. Question Lady: Speaking of the Finnish Flash, Teemu Selanne is coming in for the Heritage Classic when the old Jets play the old Edmonton Oilers. He’s only been retired for one year. He’s probably still in game shape. What if he upstages Wayne Gretzky? Answer Lady: Dave Semenko will beat him up. Question Lady: Last question…do the Jets have any chance of making the playoffs? Answer Lady: Well, two years ago, I said they wouldn’t and they did. Last year at this time, I said they would and they didn’t. This year, I say they have as much chance of advancing to the Stanley Cup tournament as I have of filling in for Frida or Agnetha at an ABBA reunion concert. Enjoy the season.